The S&P 500 (SPX) may be in the process of forming a complex corrective wave, as the entire move since 1491 presently appears corrective. For the bigger picture, this suggests it should ultimately resolve higher, but it could chop around a bit first. The wave has considerable overlap, which makes it quite difficult to determine the exact short-term structure, and thus the market's exact short-term intentions. 1503 has proven to be resistance for the time being, and that shouldn't go unnoticed. I've outlined the preferred count for the rally from 1451 to 1502 on the 3-minute chart below. Blue wave (iv) was assumed complete at 1491, but I've also noted the possibility that blue (iv) may be unfolding as a complex flat (shown in black). The expectations of the black count would be for the market to revisit 1490 +/- zone, which corresponds nicely with the rising red trend line, followed by a continuation higher. 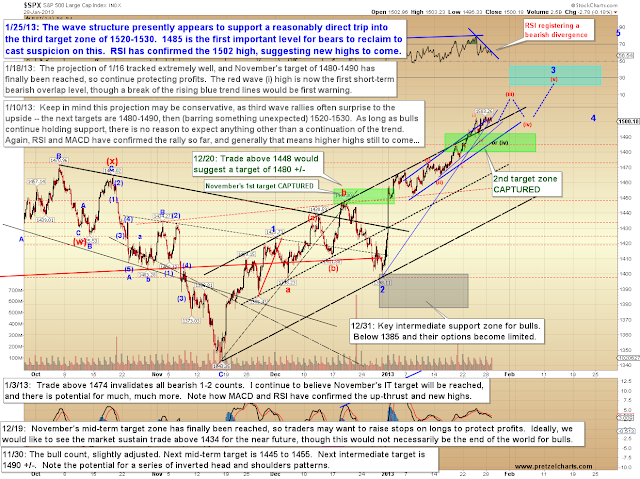 Note that there are more directly bullish possibilities, though, so a retest of 1490 isn't a foregone conclusion. Trade below 1485 would open up more bearish potentials. 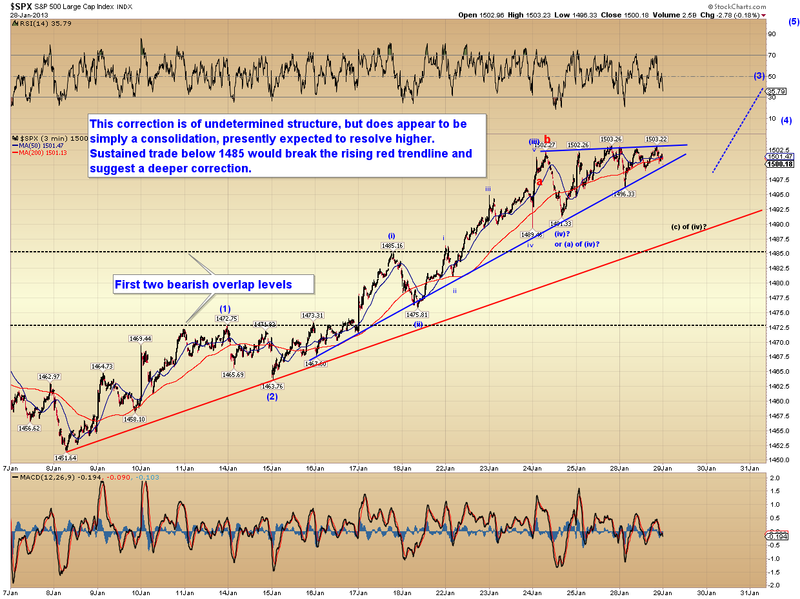 The market has struggled a bit with the 1503 level, but do note the potential of an ascending triangle formation. A clean breakout through 1504 would suggest a move to 1511-1515. On the SPX hourly, RSI has registered a bearish divergence, and MACD is on a slight bearish crossover. Presently, this is expected to result in nothing worse than a sideways/down correction, but these are warning signs that traders should stay on their toes. It's conceivable that red wave (iii) has completed in its entirety, but with the recent action, it's simply too early to tell. Regardless of the exact short-term outcome, the wave still appears to need further upside for the bigger picture. In conclusion, there are a few signs that the rally may take a breather, though that isn't a given yet -- sometimes an overlapping wave is simply winding up to move higher. Presently it's expected that any further chop will resolve higher. The first more serious warning sign for bulls would be sustained trade beneath the rising red trend line shown on the 3-minute chart; the second would be trade beneath 1485. Trade safe.